September 1938. 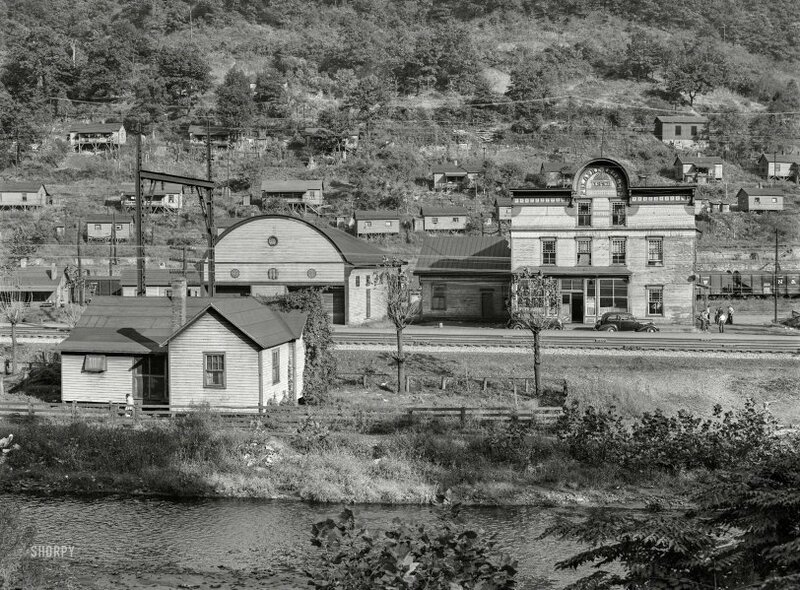 "Coal mining town of Welch [i.e., Eckman], in the Bluefield section of West Virginia." Photo by Marion Post Wolcott. View full size. Submitted by EvenSteven on Fri, 03/29/2019 - 6:56pm. It seems one of Shorpy's favorite buildings had a son who settled in West Virginia. He is not as tall as dad but you can see the resemblance. Submitted by ManyBuicks on Mon, 03/25/2019 - 10:41am. As Walter’s post would indicate and ex-N&W voices state, this photo location is of Eckman, WV. Submitted by Phaedrus on Mon, 03/25/2019 - 8:59am. About this time, a Mr Nobel realized that if you mixed highly volatile nitroglycerin with clay (or other inert substance) you created, what came to be named dynamite, which is so safe it take a strong primer to set it off. The E.I. duPont company began production and promoting it. The rest is safe blasting history. Submitted by HaroldO on Fri, 03/22/2019 - 9:26pm. Stunningly beautiful country up that way. Absolutely dangerous and difficult way to live. Submitted by Walter on Fri, 03/22/2019 - 4:09pm. Bluefield, W. Va., Dec. 14. — An explosion at Eckman today of 10,000 pounds of powder, which was being transported on three mine cars from a freight car to the powder house of the Pulaski Company, resulted in the death of one, the fatal injury of two, and the serious injury of eight others. Three of the injured are women whose homes, near the scene of the explosion, were wrecked. The wrecked houses took fire, and the scene was soon thronged with people. Timbers and empty powder cans were scattered over a large area. The men were on the powder-laden cars and the women were in the houses nearby. The powder was in tins, and was moved from a freight car to the magazine, when sparks from the motor wheels or current from the motor set it off. The houses nearby were torn into splinters, and the detonation rocked the entire village. In a few minutes hundreds had congregated and engaged in fighting the fire, which broke out as soon as the explosion occurred. Some of the wounded were horribly burned, several of them lost their eyes, and the flesh hung in tatters from their bodies. Note: According to the web site of the West Virginia Office of Miners' Health Safety and Training, this explosion killed 4 employees and 2 individuals on the surface near the mine.